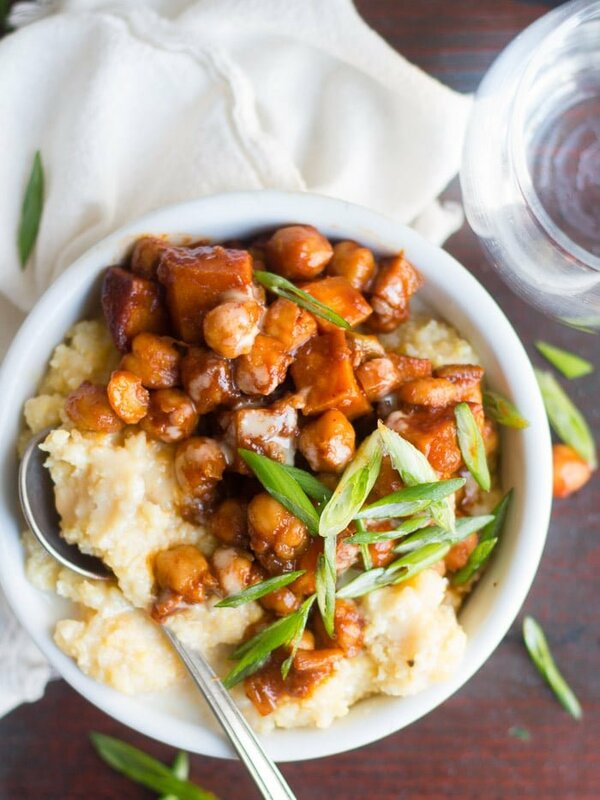 Chickpeas and tender chunks of sweet potato are simmered in sweet and zesty barbecue sauce and served atop creamy polenta to make these seriously satisfying bowls. I usually think of barbecue anything as summer food, because of the whole grilling thing. But that’s pretty silly, as I rarely grill myself — I just like to drown things in barbecue sauce! So with that in mind, barbecue is perfect for winter. Sweet, spicy, saucy and delicious. And this is one meal that fits all of those categories. In fact, I’d probably turn my nose up at this bowl on a hot day, but the other night when it was freezing out and I was perusing my list of blog recipe ideas to make, this sucker caught my attention right away. Coat the bottom of a medium saucepan with oil and place it over medium heat. When the oil is hot, add the onion and sauté until soft and translucent, about 5 minutes. Add the garlic and sauté until very fragrant, about 1 minute more. Add the water, tomato past, apple cider vinegar, molasses, soy sauce, maple syrup, chili powder, and cayenne to the pot. Stir until everything is well blended, then stir in the sweet potato. Raise heat to high and bring the liquid to a simmer. Lower the heat and allow to simmer, uncovered, for 15 minutes, stirring occasionally. Stir the chickpeas into the pot. Allow everything to simmer until the sweet potato is tender and the sauce is thick, 5 to 10 minutes more. You can add a splash of water during cooking if the sauce gets too thick. Taste test and adjust the seasonings to your liking. While the barbecue simmers, place polenta grits, 2 cups of water, and milk into a medium saucepan and stir a few times. Place over medium heat and bring to a simmer. Lower heat and allow to simmer, uncovered, for about 15 minutes, stirring occasionally and adding a bit of extra water if mixture becomes too thick. Remove from heat and allow to sit for 5 minutes. Season with salt and pepper to taste. 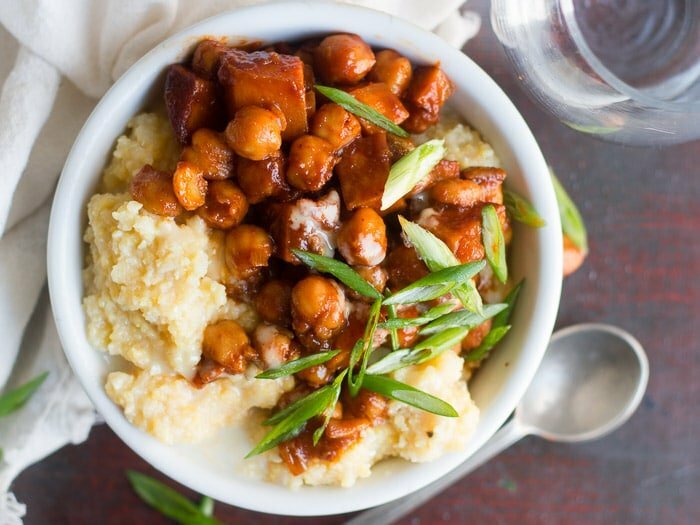 Divide the polenta into bowls, then top with the chickpea and sweet potato barbecue. Drizzle with tahini and sprinkle with scallions. Serve. Nutrition information does not include tahini. Having all the ingredients, I decided to change my plan and to give this tempting recipe a try. A big thank-you for sharing this with us. 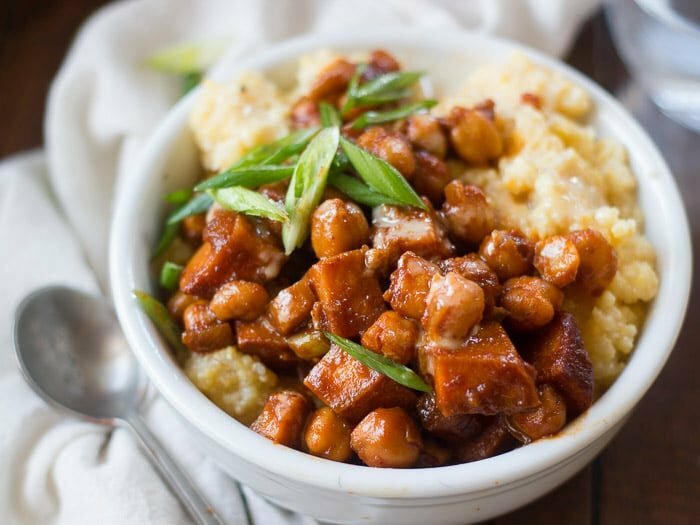 I love everything about this dish! 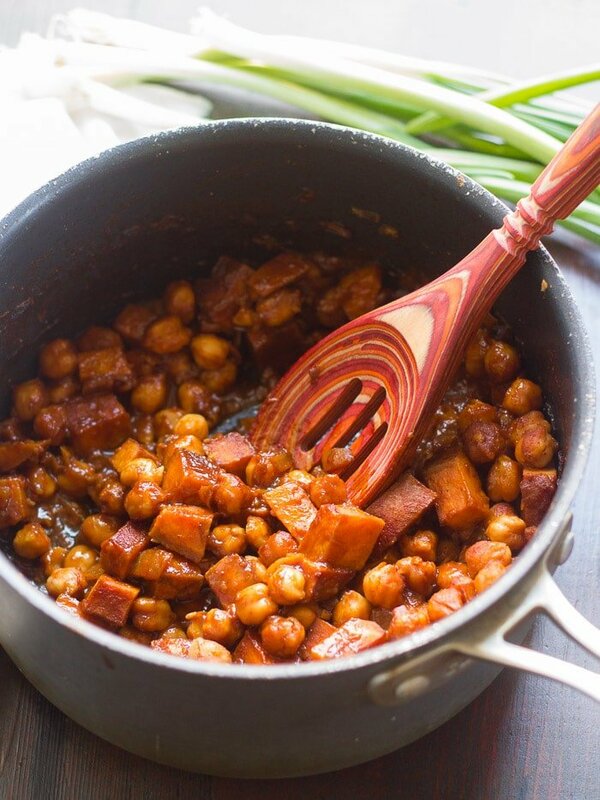 It sounds so addicting and filling, and much healthier than canned supermarket baked beans. Made this tonight and loved it! Easy to make and so flavorful. My tweaks were adding a chipotle in adobe sauce, ranch dressing instead of tahini since I had made some up for another meal and wanted to use it up, and a layer of sauteed spinach on top of the polenta to add greens visually and nutritionally. Thanks so much. Perfect dinner. Yay!! I bet this was awesome with quinoa! Glad you enjoyed it!